I shared a link on Twitter yesterday regarding the misuse of hashtags on Twitter and other social network sites. The author of the original story was of the opinion that "hashtags are ruining the English language" and by sharing it I got quite a heated response from those who disagreed with the article. In response to the heated response, I thought it would be good to write a quick post about how hashtags are supposed to work without the sensational "ruining the language" angle of the other article. 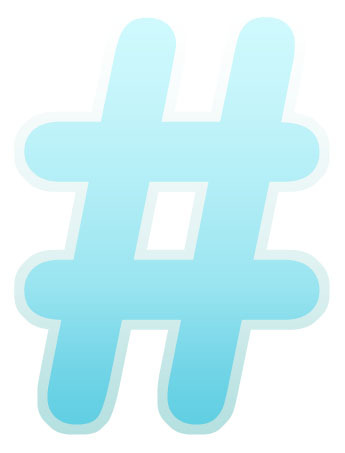 Hashtags were pioneered as a way to organize people around an idea, event, or topic. They were originally used on Twitter, but as the original article points out, they have since gained adoption on Facebook, Foursquare, etc, even though those systems weren't designed to use them properly. On Twitter, hashtags function as a hyperlink and offer a way to do a canned search for the tag. When used the way they were intended, they work remarkably well for letting people quickly find other people tweeting about the same topic. Big events are a great example of this. Rather than having to search for "New Years Eve," for example, you can just click on the #NewYears hashag people are using to see what is being said on the topic, and you can use the hash tag to include your voice in same search. TV shows have started using hashtags, too, as a quick and easy way for viewers to discuss the show. Have you been watching a show recently and seen a hashtag listed in the bottom corner? They're encouraging you and other viewers to use the tag in your tweets about the show so everyone's tweets can be gathered together. Hashtags have been used in natural disasters too, and in many cases recently, news about an earthquake, flood, plane crash, or other breaking news has hit Twitter before major news outlets. Hashtags allow people involved or at the scene of the incident to quickly congregate around the topic. But there are other, far less serious uses for it, too. These include things like Follow Friday suggestions (#FF), trending jokes, etc. Twitter's new interface design even includes a new Discover tab which features the hashtag symbol. That other article claims hashtags are ruining the language because they have become so misused lately that they are becoming all but useless. The other article used the example of typing #misingyou instead of just writing "I miss you." The problem isn't that using the hashtag is lazy, but that it doesn't help anyone. Tweeting that you miss someone is a fine, even sweet thing to do, but including the #missingyou tag doesn't provide any useful search link to others reading your tweet and becomes more clutter than anything else. Even the famous example of #winning is mostly unhelpful because nobody is really going to click on the tag to see what others are saying. Another popular thing is to include a humorous or semi-related hashtag at the end of the tweet, such as #ridiculous or #truth or even #notgonnalie. While they can be funny, they don't provide value to anyone reading the tweets, and as the author of the other article said, mostly just serve to make the person tweeting feel like they're part of an inside joke. Sure, nobody can tell anyone how to use services like Twitter. And it was average people who started using hashtags in the first place, not Twitter itself. So they can absolutely evolve over time to work differently, and mean different things to different people. But the increasing number of people who use meaningless hashtags in all of their posts often feels cluttered. Hashtags certainly aren't going to ruin the English language. But they do have an intended use that can be super helpful when used properly.